Our Facilities project manager, Dwayne, is in Germany right now absorbing everything he can about Zeppelin operations. Dwayne is responsible for working with NASA and other agencies and entities to set up the leases and agreements for the necessary facilities for us to operate. So he has to be a repository of knowledge about how much space things take up, how often they need to be moved, whether they are hazardous, whether they need special climate conditions, who needs access, how often and so on. This impacts everything from how we manage our operations to minimize risk in a historic massive wooden hangar to the provisioning of portable toilets at remote sites. And all of it involves thick legal documents and lots of red tape! 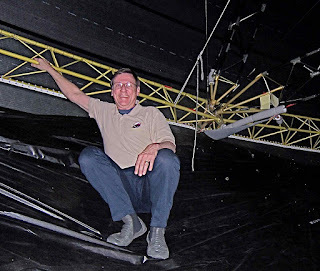 Dwayne sent us this picture of him inside the hull of #4. Nice booties Dwayne!